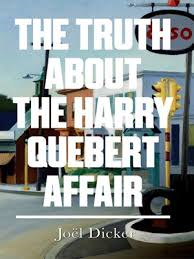 The Truth About the Harry Quebert Affair is a writer’s book. By that I don’t mean to imply that it’s a book that will be loved and revered by writers (though it may by those who wish to make a living out of writing) but that it’s a book full of writers. Its central character and narrator (Marcus Goldman) is a writer; his mentor, the titular Harry Quebert, is a writer also. Both have had the misfortune to have written one very successful book. In Harry’s case his magnum opus, The Origin of Evil, was published a number of years ago; Goldman’s success is more recent: a best-selling first novel which has left him unable to write two years later. In desperation he goes to stay with his old teacher. The Truth About the Harry Quebert Affair is a page-turner – and at 600 pages it pretty much has to be. That the pages fly by suits the animated stick figure characterisation, but as a thriller the novel works well. Early in Goldman’s visit, Harry fortuitously confesses to an affair with a fifteen year old girl, Nola, who disappeared on the very night they had planned to run away together. Cue the girl’s body being discovered years later in Harry’s yard, Harry being dragged off to jail, and Goldman determined to get to the truth and prove Harry’s innocence, while at the same time being anonymously threatened. Goldman does little more than interview people but there is an undeniable fascination in watching him apparently circle closer and closer to the truth, and Dicker constructs an intricate plot that continues to surprise until the end, with enough red herrings for Comintern’s breakfast. What Dicker adds, in making his lead character a writer, is his narrator’s ability to keep reimagining the different scenarios – what might have happened – particularly once he starts writing a books about the affair. As has been pointed out elsewhere, this seems to be a novel designed for the e-reader with its frequent recapping and retelling of events. When new information seems to contradict what Goldman already knows he simply listens to his taped interview again, allowing the reader to reread the appropriate section without having to go to the effort of finding it. The Truth About the Harry Quebert Affair has also been compared to The Girl With the Dragon Tattoo (wishful thinking on the publishers part, perhaps). In its readability, clunky prose, and literary pretentions there are some similarities, but this is a much more light-hearted affair (some of the most enjoyable sections are where it satirises commercial publishing). The blurb suggests it is the “great American novel in all but authorship” (perhaps that means in all but the way it’s written). The most American aspect of the novel is its raw commercial design – why else, for example, would it be set in America? With summer approaching, this is a novel to save for the beach – on your Kindle, of course. You are currently browsing the archives for the Joel Dicker category.